This article was originally published as: Davis, S. J. & Burnett, I. S., Collaborative editing using an XML protocol, IEEE International Region 10 Conference (TENCON 2005), Melbourne, November 21-24 2005, 1-5. Copyright 2005 IEEE. XML is a popular approach to interoperable exchange of data between a wide range of devices. This paper explores the use of the Remote XML Exchange Protocol as a mechanism to provide efficient interaction with complex XML documents to users with limited complexity devices and/or limited bandwidth connections. The interactive mechanisms provided by the protocol allow users to navigate, edit and download XML even when delivery of the full XML document is impossible. The paper examines the use of the protocol to enable multiple users to collaboratively edit remote XML documents. 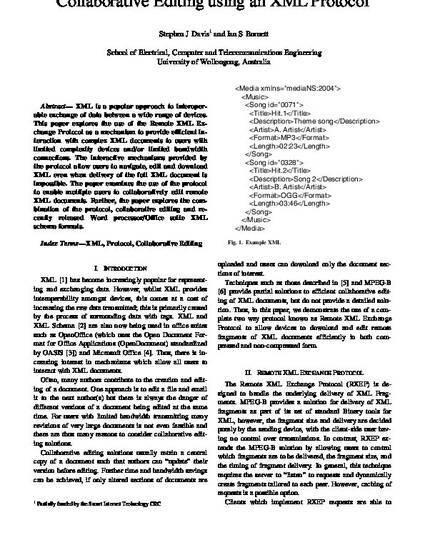 Further, the paper explores the combination of the protocol, collaborative editing and recently released Word processor/Office suite XML schema formats.